Lena Nyadbi was born circa 1937 at Walmanjilukum (Greenvale Station) in the East Kimberley. In the 1980s she witnessed the genesis of the region's contemporary painting movement, watching artists such as Rover Thomas, Paddy Jaminji and Queenie McKenzie translate their life experiences and stories from the Ngarrangkarni (ancestral times) into paintings of striking originality. Nyadbi was allowed to assist the senior artists, helping to prepare the boards by rubbing ochre onto the surface and leaving them to dry. 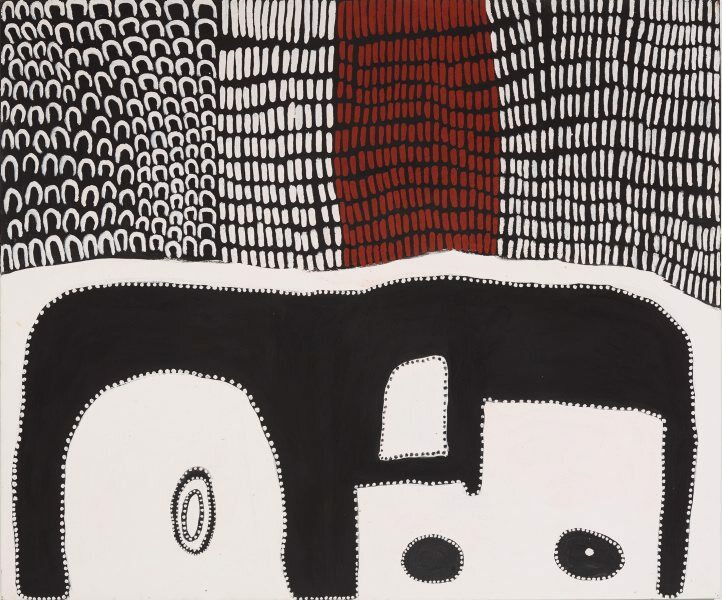 In 1998, after many years of living and working in the Aboriginal community of Warmun, Nyadbi began painting independently. The strength of Nyadbi's art, informed by her 'apprenticeship' with some of the most remarkable artists in Australia's history, was immediately apparent. Her work is noted for its innovative style and palette - distinguished by her preference for strongly contrasting colours. Nyadbi is one of the only artists to experiment with creating panels of works and repeated 'stanzas' of symbols that in combination form abstracted cultural narratives. In 2000 Nyadbi was selected for inclusion in the 'Beyond the Pale' Adelaide Biennial. Nyadbi continues to live and paint at Warmun and, like her mentors, uses natural ochres mined from her country. Today, Nyadbi is at the forefront of contemporary Gija painting and, like Queenie McKenzie before her, is an inspiration to a younger generation of artists in Warmun. Goody Barrett is Nyadbi's older sister. They regard the site of the Argyle diamond mine as their ancestral country and paint aspects of the stories associated with that country. 'Hideout' 2002 refers to the stories Nyadbi grew up hearing about her family hiding from gadiya (white people) in the cave called Geminybany before she was born. This huge rock formation is riddled with caves and provided shelter to the local families in the wet season. When pursued by murderous pastoralists Nyadbi's family hid in the warren of caves and escaped through a hidden exit to the other side of the ridge. From the top of the ridge they watched the riders systematically shoot into the spinifex grass surrounding the base of the ridge, thinking that the families where hiding there. The same limestone ridge is also the site of Binyjirrminy, the ancestral bat. The icons in the lower half of 'Hideout' 2002 represent, on the left, the cave where Nyadbi's family hid. In the middle is the place where Binyjirrminy the bat sheltered and taunted his attackers. To the right is the stone where Gija people used to grind black plum, green plum and boab seeds. The small white circle is the round grinding stone used to prepare bush food. At the top of the painting are the rows of jimbala or stone spearheads that are found scattered around the country north of Crocodile Hole and the horseshoe-shaped scales of Daiwul the barramundi whose ancestral travels formed the site around the diamond mine. The painting displays a sure sense of composition and a restrained use of colour. Black and white ochre is predominantly used in the painting. This stark opposition is alleviated by the insertion of a vertical group of red ochre jimbala in the upper section. The intensity of Nyadbi's work derives from its synthesis of the contemporary experience of East Kimberley Aboriginal communities on the pastoral frontier and the persistence of the Ngarrangkarni in the daily lives of Gija people. In 'Hideout' 2002, Nyadbi has masterfully combined the key elements of her life and work. The u-shaped scales of Daiwul (which became diamonds) and the lozenge-shaped jimbala refer simultaneously to the past and the present; as does the painting thematically in its depiction of events in the recent past and those that occurred in the Ngarrangkarni. 'Hideout' 2002 is the most accomplished and ambitious work by the artist to date. 'Hideout' 2002 was commissioned for the 'Blood on the Spinifex' exhibition held at the Ian Potter Museum of Art at the University of Melbourne (14 December 2002 - 16 March 2003). The Art Gallery of NSW has extensive video documentation and photographs of Lena Nyadbi painting this work at Kununurra in August 2002. This is part of the documentation made on a field trip to the Kimberley in preparation for the 'True Stories' exhibition (10 January - 27 April 2003).